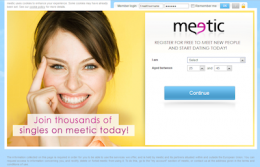 The Meetic sites are effective and easy to use and offer a free starter membership. Meetic is a large European dating network and has numerous country specific sites each served in their own language. Dating Direct is the British version of the family of Meetic sites. Meetic is one of the most popular and successful dating networks in Europe by number of members. And, though this is the British version, you are not limited to meeting people in Britain when you join. The site is presented in English, but can be translated to other languages Meetic has been around since 2002 and they have about 30,000 members on the UK site. Within their large family of sites, however, there are many more members. The site offers features like email, ecards and chat rooms, though to take advantage of the features you will need a paid membership. Once a paid member, you can create your own blog, check your horoscope and even text message other members. Their search engine is detailed and easy to navigate, making it easy to find someone who is located near you. Meetic is expensive and crap, in fact now I can’t even load the page to log on. Thankfully I didn’t subscribe to this rip off site. Fake profiles, and you can’t see a profile unless you pay, you have no idea if the person is real or in any way compatible, you have to pay to find that out. What a great way to make money.